Nourishing Herbs: Warm Up Your Life With Delicious Fire Cider!! Fire Cider (also known as Master Tonic, Cyclone Cider, Dragon Cider or Plague Vinegar) is a traditional recipe and herbal remedy with many health benefits. It has been commonly used in varying recipes for hundreds of years, likely dating back to the European plague; however, it is unknown when and where this remedy's first use began. Since the 1970's, the name Fire Cider has been promoted and shared by renowned herbalist, Rosemary Gladstar, who increased the popularity of this traditional recipe in modern herbalism. She coined the name "Fire Cider," although the general recipe can go by other names and have varying ingredients. Rosemary encourages us to make and use this delicious remedy as a daily tonic especially during the winter season or in colder climates. It's great for stimulating the immune system, clearing out congestion, warming the body and increasing circulation. Topically, you can use as a liniment to reduce aches and pains or add a ¼-1 cup to a foot bath to help peak fevers. Take 1-2 tbsp, 3-4 times daily when sick or feeling under the weather and 1-2 times daily as a tonic for its overall medicinal benefits. You can use Fire Cider straight up or incorporate it into your salad dressings and marinades. Add to cooked grains, stir fries, beans and lentils, vegetables, etc. to enhance the medicinal benefits and flavor of your meals. * Stimulate and improve digestion; reduce gas, bloating, indigestion, nausea, etc. Garlic is one of the world's oldest medicines and is an amazing spice that can ward off a variety of illnesses and be used as a preventative for various ailments including colds, flu, fever, respiratory infections, ear infections, parasites, food poisoning, candida, urinary tract infections and as a general tonic for weak immune systems. Garlic has a wide range of benefits for the immune system as it contains vitamin C and sulfur compounds and has strong antibiotic, anti-fungal, anti-cancer, and anti-viral properties. Garlic is one of the most well known remedies for the heart and circulatory system, helping to prevent and treat coronary artery disease, strokes and high cholesterol. It reduces high blood pressure by relaxing the blood vessels and platelet clot formation. With potent anti-inflammatory properties, it aids in overall pain relief from arthritis, rheumatism, fibromyalgia, lupus, and many other conditions. This pungent spice not only adds delicious flavor to our food but is also rich in vitamins and minerals, beneficial for digestion, aids the body in detoxing and is a strong blood purifier. No wonder this amazing spice is incorporated into various culinary dishes all over the world! This common food is one of the most well known spices and has had culinary and medicinal uses world wide dating back to at least 5000 B.C. 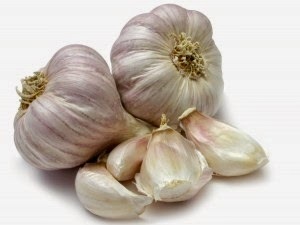 It is a cousin to garlic and they are commonly cooked with and used medicinally together. Onion is so good for everything, it could be said that "an onion a day will keep the doctor away." Although, I would not necessarily recommend eating that much as it is not needed to receive the benefits of onions and large amounts over time can create constitutional imbalances in some individuals, especially those who run hot and are easily irritable. As an immune stimulant and decongestant, it helps to prevent and treat colds, flu, fevers, coughs, sore throats and sinus and ear infections. With anti-inflammatory and analgesic properties, onions help relieve general aches and pains, especially arthritic and rheumatic. 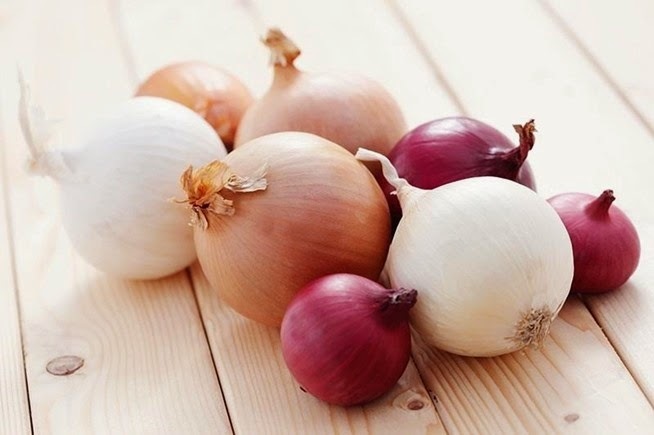 Using onion in our food not only improves assimilation of nutrients, but aids overall digestion by reducing gas, bloating, indigestion and nausea from our meals. When used regularly, it helps to control blood sugar levels and is considered a heart tonic improving overall cholesterol and hypertension. The Ancient Egyptians have been known to associate onion with general healing, longevity and eternal life. Who would have thought this commonly used food had so many benefits for us? Ginger is commonly used as a remedy for colds, flu, fever and various respiratory ailments. It is one of the best remedies for nausea, motion or morning sickness and an upset stomach. It increases the appetite, stimulates digestive functions or "digestive fire" and helps with the feeling of over eating. 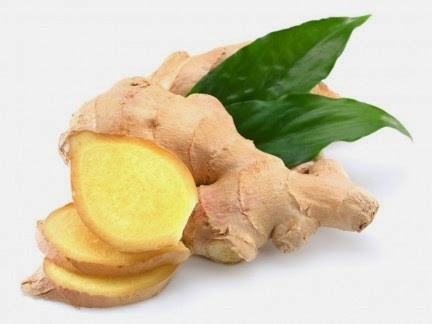 The anti-spasmodic and anti-inflammatory actions of ginger are also a great remedy for digestive and menstrual cramps as well as general pain relief. High in anti-oxidants with potent anti-tumor properties, this spice can be used to treat and prevent cancer. By increasing circulation, it is a heart tonic and helps to warm the body, especially cold hands and feet. Ginger has a stimulating and decongestant action for our entire body which all our organs can benefit from when feeling a little sluggish, especially in the colder months. Horseradish has strong antibacterial and antimicrobial properties being known to aid with any food-born bacteria such as E coli, Listeria, and Salmonella. It can be used as a preservative to extend the freshness and shelf life of our food, especially meat. 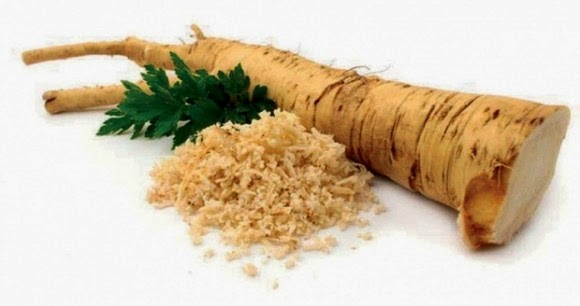 As a digestive aid, horseradish helps the body process fat and heavy meals. It stimulates the appetite, relieves gas, bloating and indigestion while helping with diarrhea, especially when triggered by gut bugs. The immune enhancing actions of this spice can reduce fevers, colds, flu, sore throats, loss of voice, pneumonia and asthma. It has both stimulating and decongesting actions to help clear out and speed the recovery from being sick. In addition to those properties, the analgesic quality of this spice also helps with general aches, pains and swelling especially from arthritis, rheumatism, gout, muscle soreness, etc. Cayenne is a spicy red pepper with culinary and medicinal uses world wide. It gives a nice 'kick' of flavor to our food with numerous health benefits and has been known to prevent and reduce coughs, colds, flu and sore throats. Its anti-inflammatory, antispasmodic and analgesic properties make it a great remedy to infuse and apply topically in low doses to relieve pain and swollen joints especially for arthritis and rheumatism. Its antiseptic use is beneficial for minor wounds and scratches and it will immediately stop bleeding. 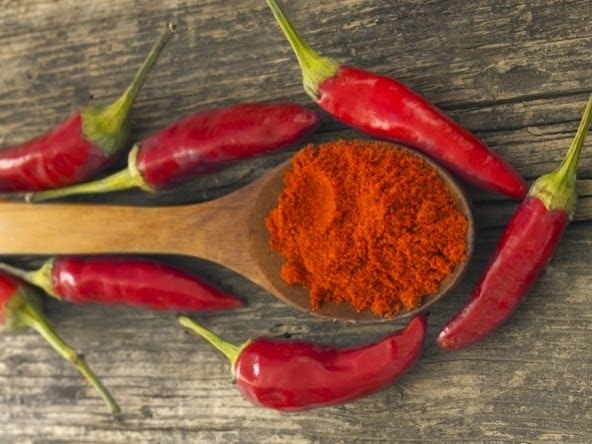 Cayenne will increase metabolic function which is helpful for weight loss and to regulate the appetite. It increases circulation, stimulates digestion, improves the body's ability to assimilate and absorb nutrients, strengthens cardiovascular health, reduces bad cholesterol levels and helps improve the normal detoxification functions of the body. A little goes a long way with this spice both in flavor and its medicinal uses. 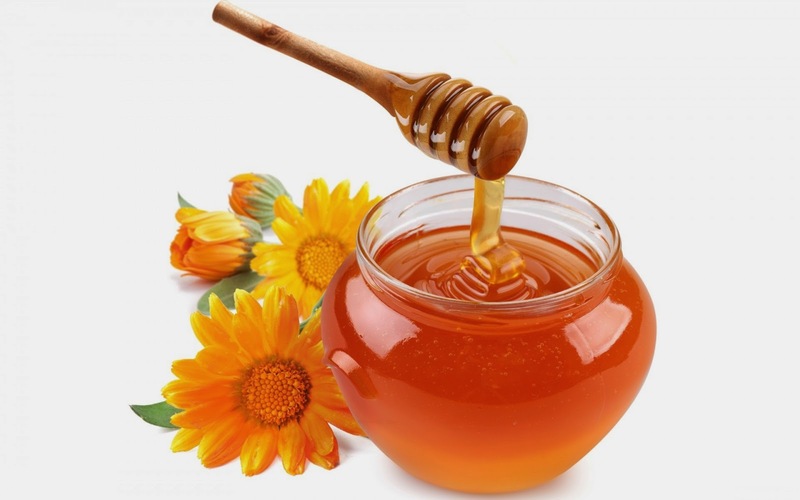 Honey has many health benefits as it is rich in anti-oxidants and is soothing for our skin and internal tissues. It has a protective nature especially for the throat, respiratory system and digestion. This sweet nectar from the bees is highly nourishing, mildly laxative and anti-microbial but especially anti-bacterial and anti-viral. It supports the immune system with anti-biotic like actions. Honey benefits overall digestion and acts as a preservative. It can be used to relive symptoms of allergies and reduce the occurrence and duration especially when used preventatively before pollen season. Using local honey is best for allergies as it will contain the local pollens and build your antibodies so you are not as likely to react when exposed. Use raw and unpasteurized honey to receive its many health benefits as the properties of honey can be damaged when exposed to heat. Vinegar is great for extracting minerals, vitamins, alkaloids and some aromatics from herbs. It can be used in both culinary and cosmetic applications. 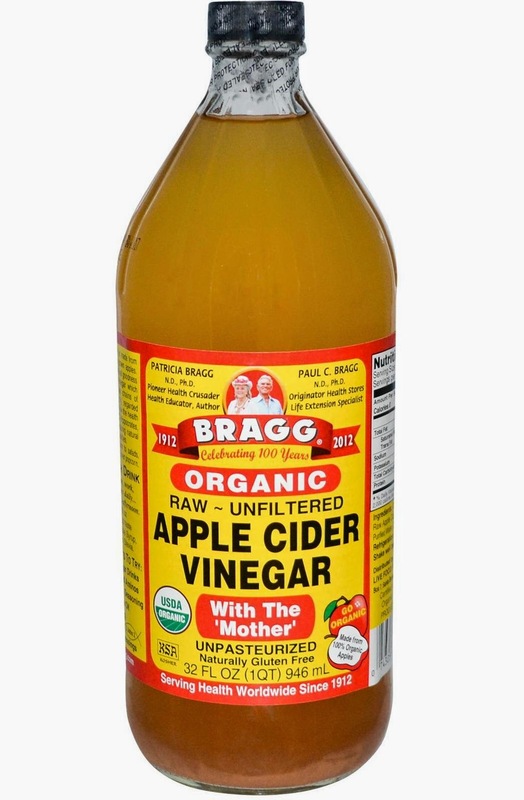 Internally, apple cider vinegar helps stimulate digestion and relieve nausea, heart burn and acid reflex. It helps to lower blood sugar levels, blood pressure and cholesterol. Vinegar encourages detoxing, helps break down fat and balances pH levels. It also aid in the prevention of colds, flu, stomach illness, sinus infections, allergies and asthma. It is a great way to infuse your herbs and take your medicine. Cosmetically, it also balances the skin's pH, is disinfecting and astringent in nature and can be used on the scalp to stimulate hair growth and reduce dandruff. For culinary use, herbal vinegar infusions are great in salad dressings, stir fries, cooked grains, vegetables, marinades and any recipe that calls for vinegar. The variety of recipes are endless and you can add any herb or spice to this traditional recipe to make it your own. I love adding other fresh culinary spices such as rosemary, sage, bay, thyme, marjoram, oregano, tarragon, etc. Or try adding the benefits of citrus fruit and peels such as lemon, lime or orange. I personally love adding nourishing herbs such as nettle, dandelion, seaweeds, burdock, etc. You will need a mason jar, cutting board, knife, grater and a mixing spoon. For the straining process, you will need muslin, cheese cloth or a stainless steel strainer and a bottle in which to store the Fire Cider. Chop the onion and garlic, and grate the ginger and horseradish. Add all ingredients into a mason jar until it is a little more than ½ filled. Add a pinch or two of cayenne (about ¼ tsp for a quart sized jar) Pour in your Apple Cider Vinegar until all the ingredients are completely saturate with 1-2 inches of extra liquid. Stir or shake the ingredients to ensure they are free flowing and not packed too tightly. Infuse for 2-3 weeks, shaking daily. Store the jar in a cool, dry and dark place. Strain using cheese cloth, muslin or a stainless steel strainer, squeezing as much of the liquid out as you can and discard or compost the herbs. Mix in honey to taste. The flavor should be hot, sweet and spicy. Bottle the fire cider and enjoy the numerous health benefits of this delicious tonic infusion. Once strained, you can store your Fire Cider in a sealed bottle/container, on the counter for about 3-12 months depending on exposure to heat, light and moisture. If you store it in a cupboard, cellar or another cool, dry and dark place it will last at least a year if it is still around that long. I make large batches and store the bulk of it in the cupboard or in a cool storage area I have for my herbs and medicine and keep a smaller bottle on the counter. Then refill it as needed. If you want to make sure it does last up to 6-12 months and you do not have a nice dark and cool place to store it, then store it in the fridge. It will last years but will maintain its strongest aromatic potency the first 6 months. In 2014, a movement spread within the herbal community to bring awareness to the benefits of Fire Cider, encouraging others to make and benefit from this tried and true recipe to stay healthy and resilient. February 2 has now become World Wide Fire Cider Making Day but I encourage you to make this tonic as often as needed, use it daily and have it around as a go to remedy when you or your family may be feeling under the weather. Try it in your cooking as a culinary addition to enhance the flavor of your meals and receive all the wonderful benefits of this blend. Experiment with the ingredients and add other herbs you like to use as tonics too. Search Pinterest for 100's of recipes and for more ideas on ingredients you can use to make your own Fire Cider. And, click here for additional information on the "Free Fire Cider" and "Traditions not Trademark" movements, including petitions, posters, and other ways to be active in returning the name "Fire Cider" to the domain of the people's traditional herbal remedies. This article was featured in Humboldt Herbals' monthly newsletter for March 2014. ***Let us know what you think of this fire cider recipe in the comments below. What herbs and spices do you like to use in your fire cider? What are your favorite ways of using fire cider?